Although it is normal that the poop or feces smell bad, when that smell is abnormal or foul it is common for us to worry excessively. What are its causes and what to do? Did you know that stool helps us discover how our health is? In fact, they become a really valuable source of information about different aspects of our organism, being useful for example as a warning sign, symptom, sign or signal if there is any type of condition or pathology that causes a change in them. Thus, normal stools are those that have a medium brown tone, which means that the color of the stools is neither very dark nor very clear (a middle term, after all). So any change in their tonality, especially when this change tends to be maintained over time, can become a signal and therefore a cause for concern. Thus, for example, the stools become yellow or clay-colored when there is an infection or inflammation of the intestines (gastroenteritis), in addition to when there is a hepatobiliary obstruction or a digestive inflammation (gastritis). The presence of black stools can be indicative of bleeding in the stomach or small intestine, while the existence of red stools indicate the presence of hemorrhages located in the lower gastrointestinal tract. How is the normal smell of stool? On the other hand, the smell of faeces also inform us a lot about our digestive health. For example, healthy stools do not have a bad smell; It is common that in fact they are practically odorless, although it is true that depending on what we have eaten or drunk it is normal that there always exists a certain smell. What happens when the stool smells really bad? However, when we find a foul odor in the stool can be an indication of a health problem. 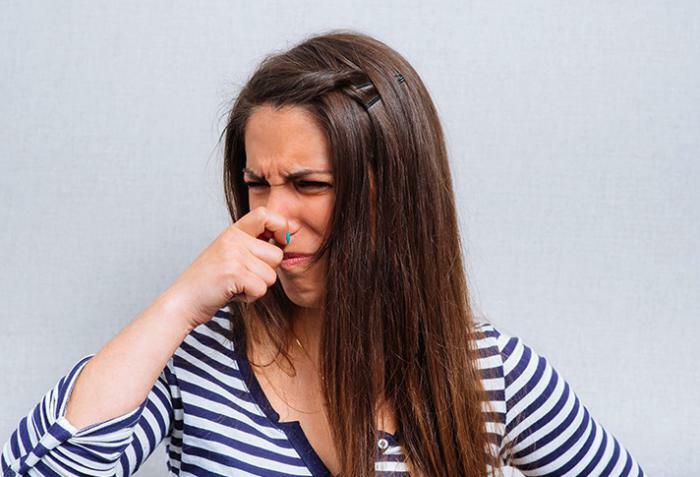 That is, whenever an unpleasant, foul or stinking odor is present, it may be a sign of a health condition. When this bad odor appears in a timely manner, and does not remain in time, we must be calm, since it means that the stool is spending too much time inside the intestines before its evacuation occurs, so that it causes the appearance of certain bacteria that produce gases, which in turn are the cause of the bad smell. This can be a clear indicator that the bacterial flora is not functioning correctly, or even that its quantity is insufficient. On the other hand, when we introduce some change in our diet it is also common for the state of our stool to change, not only its color and texture, but also its smell. But when that bad smell becomes something unpleasant, not normal, and that also remains in time, we must be alarmed. Intestinal infection: It is one of the most common. It is common to occur as a result of an infection in the intestines, as for example can be the case of gastroenteritis (either viral or bacterial). Celiac disease: It consists of a condition caused by damage to the lining of our small intestine as a consequence of a reaction to the ingestion of foods with gluten. It is also known as celiac disease. Malabsorption: It occurs when our body is not able to absorb nutrients from food, whether vitamins, proteins, sugars, proteins or fats. It can be caused by conditions or damage to the small intestine, as well as problems in the pancreas. Chronic pancreatitis: Pancreatitis is inflammation of the pancreas, while chronic pancreatitis is one that occurs in a prolonged way, getting worse over time. Crohn’s disease: This is a condition in which some parts of the digestive tract are inflamed. It basically consists of a form of inflammatory bowel disease (IBD). Therefore, in the presence of a change in our faeces abnormal, not only in terms of smell, but texture or appearance and color, it is advised to go to the medical specialist, who will inquire about the existence of any possible condition or problem of Health.